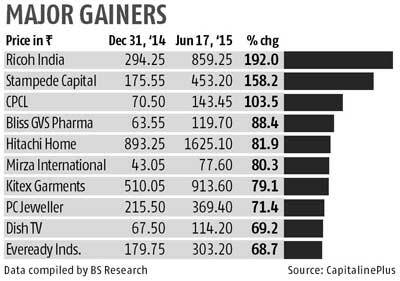 A strong financial performance and foreign institutional investors (FIIs) interest in some of the counters have fuelled the rally in these stocks, analysts say. Even as the benchmark indices have recorded negative returns thus far in the current calendar year, a clutch of stocks have bucked the trend and outperformed the markets. An analysis of 753 companies from the BSE-500, mid-cap and small-cap indices shows that 285 stocks have outperformed the benchmark indices by recording positive returns. 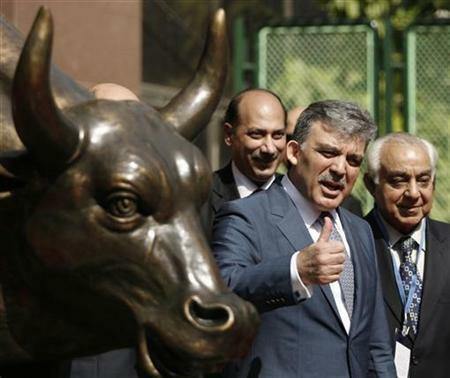 Of these, 32 stocks gained over 50 per cent and another 153 companies moved up between 10 per cent and 50 per cent. By comparison, the S&P BSE Sensex and CNX Nifty have corrected two per cent each thus far in calendar year (CY) 2015, while S&P BSE Small-cap index and S&P BSE Mid-cap indices have slipped three per cent and 0.27 per cent, respectively till Wednesday. Kitex Garments, Hitachi Home & Life Solutions, Eveready Industries, Aegis Logistics, BEML, Ricoh India, Chennai Petroleum Corporation, Dish TV, Titagarh Wagons and Welspun India are among few stocks that have surged more than 50 per cent since December 2014. Ricoh India, the largest gainer among these pack, has rallied 192 per cent from Rs 294 to Rs 859 on the BSE so far in the current calendar year. The company had reported nearly three-fold jump in its standalone net profit at Rs 41.48 crore for the quarter ended March, against Rs 14.23 crore a year ago. Besides Chennai Petroleum Corporation Limited (CPCL) that rallied 103 per cent, Mangalore Refinery & Petrochemicals (MRPL), Bharat Petroleum Corporation (BPCL) and Hindustan Petroleum Corporation (HPCL) from the refinery sector have rallied between 25 and 50 per cent. UPL, PI Industries, Bayer Crop Science from agrochemicals, SML ISUZU, Ashok Leyland and Eicher Motors from automobiles, Britannia Industries, Gillette India, Marico, Godrej Consumer Products and Emami from fast moving consumer goods (FMCG) and Mirza International and Relaxo Footwear from footwear sector have gained more than 15 per cent each so far in the calendar year 2015. Outlook Analysts remain optimistic on the road ahead for the automobile sector, especially the passenger car and the commercial vehicle segments. Maruti Suzuki and Ashok Leyland are the top picks of R Sreesankar, head of institutional equities at Prabhudas Lilladher. “Our call of the headwinds in terms of rural consumption post the unseasonal rains could result in slowdown in demand for two wheelers in rural areas, affecting the off take of motorcycles,” he says. Sachin Bobade, an analyst tracking the FMCG sector at Karvy though continues to remain cautious on the consumer space and believes that the monsoon would play vital role in overall sector performance. “In addition, ongoing concerns related to economy and rural growth would remain key challenges, going ahead,” he says.